For comparison and user tests performed by non-profit product test organizations or TÜV Rheinland, OMRON medical devices always occupy the top position. As the first medically technical company, OMRON obtained the TÜV Rheinland-approved medical wellness certification from the Medical Wellness-Verband (DMWV) and the International Medical Wellness Association (IMWA). OMRON-devices are not only functional, they are also attractive: this is why the superb design of the modern OMRON technology has already been presented multiple times with the product design award. Every year the Praxis-Depesche presents an award for medicine, medical products, and therapy and diagnosis devices. OMRON Guarantee - In a class of its own. Because of the high quality, OMRON can offer a three-year guarantee on all medical devices. Intellisense Technology – The patented OMRON development for fast and comfortable blood pressure measuring: Gentle measurement during the inflation, and pulse- and speed-optimized measurement during the inflation phase allows for a short measuring time. This makes measuring painless. OMRON Arrhythmia Sensitive Technology – OMRON blood pressure devices can recognize irregular beats. Cardiac arrhythmia during the measurement can skew the measurement results. As such, the results are only displayed if the blood pressure measurement is not influenced. OMRON Morning High Blood Pressure Recognition - Most heart attacks and strokes take place in the morning hours. 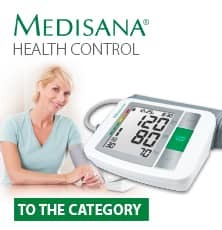 Blood pressure devices with this qualification recognize high blood pressure in the morning and show this as a warning symbol. Metabolic Syndrome Prevention – In the fight against metabolic syndrome, OMRON makes a special medical selection available, plus guidance material.